This was my Saturday score: well, some of it. I also got an awesome collection of yellow and blue hardback Nancy Drew novels, some clothes for the kids (among which an awesome vintage dress-which I packed away in the 2T box before I took pictures, alas), and a 1963 Atlas book (same one my parents have-awesome)! I am loving that yellow gingham and navy stripe together. Too bad the yellow is a fuzzy backed plastic tablecloth. I might have to go buy some yellow gingham.I'm also excited about the lamp. I've been wanting a lamp for awhile, but never found anything that I "loved." I love this one, except the brown part. I will spray paint it yellow or white, obviously, do other colors of spray paint exist? Oh, and those boots have never been worn, and for $6 how could I say no? My size? My favorite color? It's like they left them there just for me!OOOOOOoooo I love the thrift store! Anyway, so I thought I'd share some of my tips on thrift store shopping while I was at it. 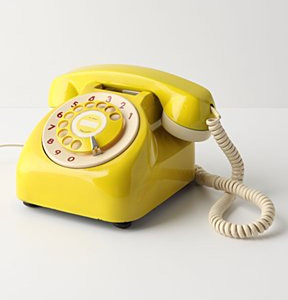 okay, so this one isn't "vintage" it's from anthropologie, but I'm just not willing to spend $200 on a phone . . .
2. I always swing past the sheets/and pillowcases and see what they have there. I use this guide by Candace of Sparkle Power. (She was the one that taught me a love for vintage sheets in real life :). 3. I check the dishes/ kitchen ware for anything yellow or made out of milk glass. One day I will have a beautiful hutch or cabinet to display it in. Someday. But that's just me. 4. **This one I think is especially important. ** Unless you want a hodge podge of vintage-which in and of itself can be cool-try to stick with a theme for your vintage-ness. Of course my theme is yellow. But it could be deers, or flowers, or lace, or of course a color. But it helps tie it all together and make all these found objects more co-hesive. Plus, it will keep you from buying a boat load. I find things all the time that I think are cool, like pyrex, casserole dishes with flowers on the side, but 9 times out of 10 they aren't yellow so I pass them up. 5. Ask yourself several times and in different ways. "Will I really use this?" or even more helpful to me, "Will I think about this for a month and kick myself for not buying it if I pass it up?" That's usually the clincher for me. If I can't stop thinking about it and love it immediately I usually buy it. If I like it, think it might be useful, want to love it, know someone else who will love it, but don't love it, I don't buy it. Usually. Like the bright yellow 60s drop waist pleated skirt dress I found. It was bright, I almost passed it up. 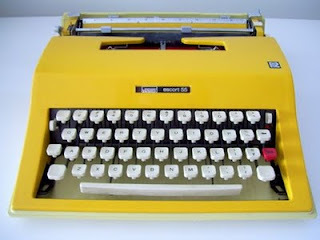 But it was yellow. . . and I love pleats. But it was so bright. I went back and forth. Finally I said to myself "will I dare wear this anywhere?" the answer was probably not. So I left it there. 6. Be picky about quality. After I've decided I'm going to purchase something I try and find all the reasons why I shouldn't, is there anything wrong with this? As in the case of the bright yellow dress (even though it was only five bucks) the material had all these little fuzzy pills in the rayon fabric. It bugged me. Alas. So it made me feel better about leaving it be. 7. If at all possible don't bring your kids. Usually I do, usually I don't spend as much time as I'd like either. It's too hard to make decisions. 8. Be prepared to walk out if they don't have anything you want. Don't feel like you have to buy something just because you went in. This is especially true if you go often-which if you really have a "list" of things you are looking for might be a good idea. Really, just go with a plan, an idea of what you want. they can be overwhelming and they can be time consuming, and they can be a little bit scary dirty but rest assured I've never gotten a booger on my finger. You are definitely not alone. . . I too dream of a hutch to display all these antiques I'm collecting. Thank you for some wonderful tips! I'm rather new to thrift stores and am a bit to impulsive! I shall take note of this post and slow down a little! I just love the yellow goodies you have, I have a major thing for yellow too, so refreshing! Funny, I always swing by sheets too now because of Sparkle Power! Happy shopping!